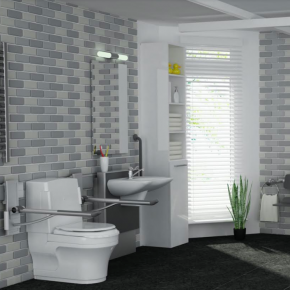 The poll follows recent surveys, which further identified that an accessible WC and shower were rated the most important accessibility features by 90% of respondents, and that a growing number of homes are multi-generational. Closomat, Britain’s leading manufacturer of accessible toilet solutions, is allowing private and social housing providers to meet the requirement easily and cost-effectively. It has developed a combination of packages that facilitate provision of enabling toileting equipment, from design to occupation- and beyond. Robin Tuffley, Closomat marketing manager, spoke about how the company ‘can take the hassle away’. “We have almost 60 years’ experience in adapting homes to enable people to undertake their intimate hygiene independently, for as long as possible. That experience is brought to bear in our project management and life maintenance offerings,” he commented. The project management package provides design advice, supply, install, and commissioning across Closomat’s product offering, including shower toilets, toilet lifters, washbasins, shower seats, ceiling track hoists. It is fully Construction (Design & Management) compliant and the new Palma Life package gives, through a singe up-front price, supply and commissioning of the top-selling shower toilet, the Closomat Palma Vita and a decade’s service & maintenance. Closomat’s Palma Vita is already the most popular wash dry toilet to be installed that enables clients to go to the toilet on their own, with dignity. It is proven to offer the best wash and dry performance available and is also the only wash dry toilet that can be accessorised, initially and retrospectively, to accommodate individual, changing needs, so it can continue to deliver independence and optimum hygiene even if the occupant’s condition deteriorates. Closomat WCs are also proven to be durable, with many still in daily use, 30 years’ after being installed. Closomat was the first company to introduce shower toilets into the UK and, uniquely, it is the only shower toilet company based in Britain, with British manufacture and full customer support before, during and after sales. Furthermore, it is the only company in the sector to have its own, dedicated, nationwide team of service engineers, who commission every unit and deliver subsequent annual servicing and maintenance.